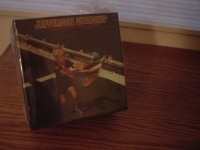 "Jefferson Starship, Freedom At Point Zero 11 CD OBI Box Set"
Limited Japanese STARSHIP FREEDOM AT POINT ZERO OBI CD Box Set includes 11 Japanese OBI MINI REPLICA LP'S. - KNEE DEEP IN HOOPLA - EARTH - DRAGON FLY - FREEDOM AT POINT ZERO - MODERN TIMES - WINDS OF CHANGE - NUCLEAR FURNITURE - RED OCTOPUS - SPITFIRE - NO PROTECTION - LOVE AMONG THE CANNIBALS Japanese OBI MINI REPLICA BOX SET Japanese re-mastered Mini LP replica Limited Edition Collection Recorded from the finest Original Masters available. Each title Comes with anti-static sleeves similar to Vinyl LPs, Cardboard packaging exact to the original LP, plastic wrap cases for protection of each collectible Actual miniaturized version of the 12" LP in 4" CD version Special VERY RARE LIMITED EDITION BOX SET ONLY PRODUCED ON FUTURES FOR THIS ONE TIME PRESSING -- were only available in Japan. Limited Japanese STARSHIP FREEDOM AT POINT ZERO OBI CD box includes 11 Japanese OBI MINI REPLICA LP'S. - KNEE DEEP IN HOOPLA - Track Listings 1. We Built This City - Starship, Lambert, Dennis 2. Sara - Starship, Wolf, Ina 3. Tomorrow Doesn't Matter Tonight - Starship, Cristol, Steven 4. Rock Myself to Sleep - Starship, Rew, Kimberley 5. Desperate Heart - Starship, Goodrum, R. 6. Private Room - Starship, Chaquico, C. 7. Before I Go - Starship, Roberts, David 8. Hearts of the World (Will Understand) - Starship, Lunt, Stephen Broug 9. Love Rusts - Starship, Taupin, Bernie EARTH - Track Listings 1. Love Too Good - Jefferson Starship, Chaquico, Craig 2. Count on Me - Jefferson Starship, Barish, Jesse 3. Take Your Time - Jefferson Starship, Slick, Grace 4. Crazy Feelin' - Jefferson Starship, Barish, Jesse 5. Skateboard - Jefferson Starship, Chaquico, Craig 6. Fire - Jefferson Starship, Buchwald 7. Show Yourself - Jefferson Starship, Slick, Grace 8. Runaway - Jefferson Starship, Dewey, Nicholas 9. All Nite Long - Jefferson Starship, Barish, Jesse DRAGON FLY - Track Listings 1. Ride the Tiger - Jefferson Starship, Kantner, Paul 2. That's for Sure - Jefferson Starship, Chaquico, Craig 3. Be Young You - Jefferson Starship, Slick, Grace 4. Caroline - Jefferson Starship, Balin, Marty 5. Devils Den - Jefferson Starship, Creach, Papa John 6. Come to Life - Jefferson Starship, Freiberg, David 7. All Fly Away - Jefferson Starship, Palumbo, John 8. Hyperdrive - Jefferson Starship, Sears, Pete FREEDOM AT POINT ZERO - Track Listings 1. Jane - Jefferson Starship, Freiberg, David 2. Ligtning Rose (Carry the Fire) - Jefferson Starship, Kantner, Paul 3. Things to Come - Jefferson Starship, Kantner, Paul 4. Awakening - Jefferson Starship, Sears, Jeanette 5. Girl with the Hungry Eyes - Jefferson Starship, Kantner, Paul 6. Just the Same - Jefferson Starship, Chaquico, Craig 7. Rock Music - Jefferson Starship, Chaquico, Craig 8. Fading Lady Light - Jefferson Starship, Sears, Jeanette MODERN TIMES - remastered Japanese reissue of their smash top 30 1981 album. Out of print in the U.S., it features 20 bit K2 Super Coding, plus the top 30 hit 'Find Your Way Back' and the top 50 'Stranger'. Track Listings 1. Find Your Way Back - Jefferson Starship, Borsdorf, Thomas 2. Stranger - Jefferson Starship, Sears, Pete 3. Wild Eyes - Jefferson Starship, Kantner, Paul 4. Save Your Love - Jefferson Starship, Sears, Pete 5. Modern Times - Jefferson Starship, Kantner, Paul 6. Mary - Jefferson Starship, Sears, Jeannette 7. Free - Jefferson Starship, Thomas, Mickey 8. Alien - Jefferson Starship, Sears, Jeannette 9. Stairway to Cleveland (We Do What We Want) - Jefferson Starship, Kantner, Paul WINDS OF CHANGE - Track Listings 1. Winds of Change - Jefferson Starship, Sears, Pete 2. Keep on Dreamin' - Jefferson Starship, Chaquico, Craig 3. Be My Lady - Jefferson Starship, Sears, Jeannette 4. I Will Stay - Jefferson Starship, Sears, Jeannette 5. Out of Control - Jefferson Starship, Kantner, Paul 6. Can't Find Love - Jefferson Starship, Slick, Grace 7. Black Widow - Jefferson Starship, Slick, Grace 8. I Came Back from the Jaws of the Dragon - Jefferson Starship, Kantner, Paul 9. Quit Wasting Time - Jefferson Starship, Sears, Jeannette NUCLEAR FURNITURE - Track Listings 1. Layin' It on the Line - Jefferson Starship, Chaquico, Craig 2. No Way Out - Jefferson Starship, Wolf, Peter  3. Sorry Me, Sorry You - Jefferson Starship, Sears, Peter 4. Live and Let Live - Jefferson Starship, Sears, Peter 5. Connection - Jefferson Starship, Kantner, Paul 6. Rose Goes to Yale - Jefferson Starship, Kantner, Paul 7. Magician - Jefferson Starship, Slick, Grace 8. Assassin - Jefferson Starship, Sears, Peter 9. Shining in the Moonlight - Jefferson Starship, Chaquico, Craig 10. Showdown - Jefferson Starship, Slick, Grace 11. Champion - Jefferson Starship, Kantner, Paul RED OCTOPUS - Track Listings 1. Fast Buck Freddie - Jefferson Starship, Slick, Grace 2. Miracles - Jefferson Starship, Balin, Marty 3. Get Fiddler - Jefferson Starship, Creach, John 4. Al Garimasu (There Is Love) - Jefferson Starship, Slick, Grace 5. Sweeter Than Honey - Jefferson Starship, Chaquico, Craig 6. Play on Love - Jefferson Starship, Slick, Grace 7. Tumblin - Jefferson Starship, Balin, Marty 8. I Want to See Another World - Jefferson Starship, Kantner, Paul 9. Sandalphon - Jefferson Starship, Sears, Pete 10. There Will Be Love - Jefferson Starship, Kantner, Paul 11. Miracles - Jefferson Starship, Balin, Marty 12. Band Introduction - Jefferson Starship, 13. Fast Buck Freddie - Jefferson Starship, Slick, Grace 14. There Will Be Love - Jefferson Starship, Kantner, Paul 15. You're Driving Me Crazy - Jefferson Starship, Smith, Vic SPITFIRE - Track Listings 1. Cruisin' - Jefferson Starship, Hickox 2. Dance with the Dragon - Jefferson Starship, Balin, Marty 3. Hot Water - Jefferson Starship, Sears, Pete 4. St. Charles - Jefferson Starship, Balin, Marty 5. Song to the the Sun: Ozymandias/Don't Let It Rain - Jefferson Starship, Barbata, John 6. With Your Love - Jefferson Starship, Balin, Marty 7. Switchblade - Jefferson Starship, Slick, Grace 8. Big City - Jefferson Starship, Barbata, John 9. Love Lovely Love - Jefferson Starship, Barish, Jesse NO PROTECTION - Track Listings 1. Beat Patrol - Starship, Warman, Johnny 2. Nothing's Gonna Stop Us Now - Starship, Warren, Diane 3. It's Not Over ('Til It's Over) - Starship, Nevil, Robbie 4. Girls Like You - Starship, Chaquico, Craig 5. Wings of a Lie - Starship, Wolf, Peter [Keyboa 6. The Children - Starship, Page, Martin 7. I Don't Know Why - Starship, Slick, Grace 8. Transatlantic - Starship, Fig, Anton 9. Say When - Starship, Roberts, David 10. Babylon - Starship, Funderburk, Tommy 11. Set the Night to Music - Starship, Warren, Diane LOVE AMONG THE CANNIBALS - Track Listings 1. The Burn - Starship, Page, Martin 2. It's Not Enough - Starship, Funderburk, Tommy 3. Trouble in Mind - Starship, Feeney, Joel 4. I Didn't Mean to Stay All Night - Starship, Lange, Robert John 5. Send a Message - Starship, Thomas, Mickey 6. Wild Again - Starship, Bettis, John 7. Love Among the Cannibals - Starship, Morgan, Mark 8. Dream Sequence/We Dream in Color - Starship, Morgan, Mark 9. Healing Waters - Starship, Page, Martin 10. Blaze of Love - Starship, Thompson, Chris 11. I'll Be There - Starship, Thomas, Mickey These are Japanese digitally re-mastered Mini LP replica CDs (the OBI Edition). This Limited Edition Collection has only VERY FEW made world-wide and are immediately Out of Print. Recorded from the finest Original Masters available. Comes with anti-static sleeves similar to Vinyl LPs, Cardboard packaging like an LP. Actual miniaturized version of the 12inch LP in 4inch CD version.